These syndromes are very rare in the general population, though some are relatively common in certain ethnic groups. People with these syndromes usually suffer from repeated episodes of fever and general unwellness, sometimes with other symptoms such as rashes, stomachaches and painful swollen joints. Each time that such an episode occurs, the patient recovers, usually within a few days, without any clear cause being identified. Each syndrome is described in more detail here. In most cases, symptoms begin in early childhood, although some people only develop the symptoms in adulthood. In all these syndromes there is over activity of part of the body’s natural defence system, the immune system. The immune system involves a wide variety of different types of blood cells and molecular messengers. These components interact together through a variety of complex mechanisms, known as pathways. The part of the immune system affected in inherited fever syndromes is called innate immunity. In healthy people, normal activation of the innate immune pathways occurs when the body encounters some type of tissue damage or disease. The consequent inflammation helps to fight disease and promote recovery. 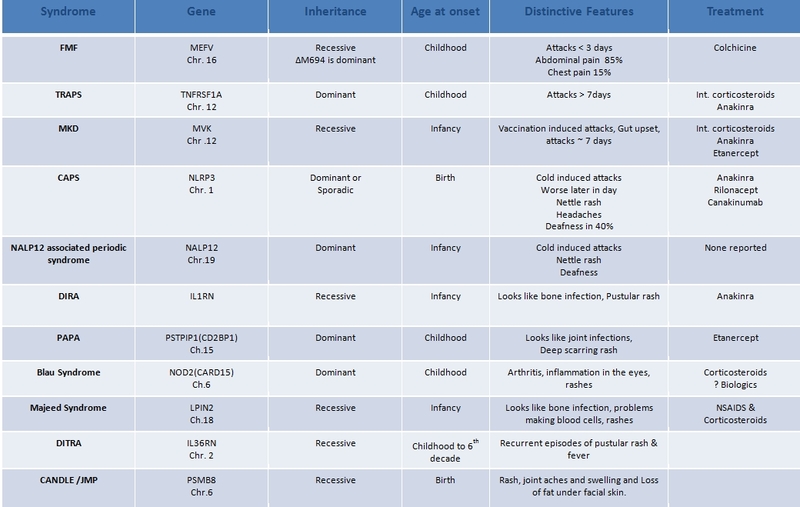 In the inherited fever syndromes, some of these pathways are over-active. This leads to an over-aggressive immune response. The body acts as if there was a serious infection even when there is no actual disease or tissue damage acting as a stimulus. There is a state of prolonged inflammation, known as auto-inflammation. Auto-inflammation itself leads to symptoms of disease and sometimes to tissue damage. Different pathways are implicated in different types of inherited fever syndromes. Treatment aims to “switch off” the overactive inflammatory pathway and depends on precise identification of the particular syndrome, and pathway affected. Auto-inflammation is quite different to auto-immunity. In auto-immune diseases, the body produces antibodies against its own tissues, which then cause damage. In auto-inflammatory conditions the body does not produce antibodies against its own tissues. Auto-immune diseases are far commoner than auto-inflammatory syndromes. Auto-immune diseases include conditions such as childhood diabetes and rheumatoid arthritis. What types of inherited fever syndrome are there? People with these syndromes usually have a normal life expectancy, unless they develop AA amyloidosis. AA amyloidosis can be prevented nowadays by effective drug treatment. The commonest syndrome is Familial Mediterranean Fever (FMF). This was first described in 1945 but the genetic problem was only discovered in 1997. Scientific understanding of these diseases is progressing very rapidly. The number of diseases and genes identified is expected to increase every year. Who is affected by the inherited fever syndromes and how common are they? The inherited fever syndromes affect men and women equally. It is the commonest genetic disease in these populations, where it may affect between 1 in 250 to 1 in 1,000 individuals. In some Eastern Mediterranean populations 1 in 4 people are carriers of an FMF-causing mutation. It has been suggested that carrying this gene may have provided some kind of survival benefit in the past, possibly through improved resistance to infection. FMF is far less common in other ethnic groups, but it can affect anyone. The other hereditary periodic fevers are less common, and are believed to affect only about 1-2 people per million of the population. TNF receptor associated periodic syndrome (TRAPS) is the second commonest of the inherited fever syndromes. It was originally thought to be commonest in North Western Europe but it is now known that it can affect people from all around the world. Hyper-immunoglobulin D syndrome and periodic fever syndrome (HIDS) mostly occurs in populations from North Western Europe. Cryopyrin Associated Periodic Syndrome (CAPS) includes 3 diseases, of which Muckle wells Syndrome is most common in the UK and familial cold urticaria (FCU) is most common in North America. What symptoms do the inherited periodic fever syndromes cause? in some syndromes a gradual onset of deafness. Attacks often start in childhood but 10% of patients get their first symptoms after the age of 40 years. How are the inherited periodic fever syndromes diagnosed? Some doctors have never heard of these syndromes, and most have seen few if any cases. So it may take time before the possibility is raised that a patient may have a periodic fever syndrome. Ultimately the diagnosis is usually made by a combination of suspicious symptoms and blood tests plus a finding of an abnormal genetic result. Genetic testing is difficult to do and expensive so only a very limited number of laboratories in the world (including ours) offer the tests. Different treatments are available for the different syndromes (see table and details on individual syndromes). How does inheritance of the inherited periodic fever syndromes work? The human body is made up of millions of tiny cells, each of which contains identical copies of the genes which we inherit from our parents. These genes function like an instruction manual, or a recipe book for the cells to construct the proteins and other substances which make up the body. Human cells each contain about 25,000 different genes. Each cell contains two copies of each gene, one from each of our parents. Within each cell, the genes are arranged into 46 long strings, called chromosomes. 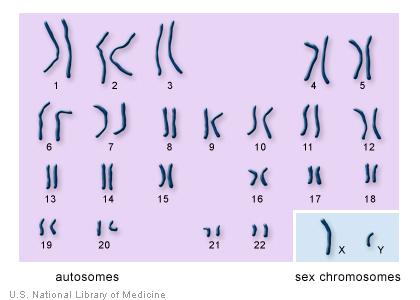 23 chromosomes come from the father and 23 from the mother. Complicated interactions between the two copies of each gene determine how the body is composed, inside and out. External traits, like hair colour, eye colour and height and internal traits like blood group are all a consequence of which genes we inherit from our parents. How do mutations cause inherited fever syndromes? The genes act like an instruction manual or a recipe for protein production inside every cell of the body. 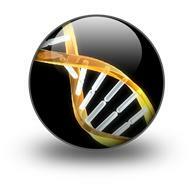 Sometimes an alteration or error may arise within a gene. This is called a mutation. 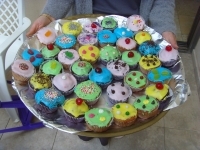 Anyone who has ever baked a cake knows that a single error in the recipe may have a number of different effects on the final product. It may lead to complete disaster, for example if you put in salt instead of sugar, or forgot the baking powder. Alternatively, there may be little effect on the final product, for example if you used margarine instead of butter. Similarly, a mutation in a gene may have a number of different effects. Some mutations have minimal effects or no effects either on the proteins produced or on the person’s health. Other mutations may lead to abnormal protein production, causing a wide variety of diseases. The mutated genes that cause inherited fever syndromes have important effects on the abnormal, so-called variant proteins whose production they determine. They often just cause a small change in the structure of these proteins, so that an abnormal protein called a “variant” protein is produced. These variant proteins do not work like the normal (“wild type”) protein. They may work less well or sometimes they may be overactive. In inherited fever syndromes the variant proteins are involved in regulating inflammation. The changes in the protein resulting from the gene mutation cause faulty regulation. This leads to an over aggressive immune response as if there was a serious infection. Complex rules control the inheritance of many characteristics, and of many diseases. These rules determine everything about us, from the colour of our eyes, hair and skin to our food preferences, musical talents and tendency to develop certain diseases. Many inherited fever syndromes are inherited in a fashion known as autosomal recessive. A few are inherited in accordance with different rules, in a fashion known as autosomal dominant. Autosomal recessive inheritance is illustrated in the figure above. The blue box represents an affected gene, carrying a mutation and the yellow-brown box represents an unaffected (normal) gene. The two columns next to each person in the figure represent two identical chromosomes (strings of genes) each person inherits, one from each parent. When a condition is autosomal recessive, only people with 2 copies of a mutated gene develop the condition. People with just one mutated copy of the gene are known as “asymptomatic carriers”. This means that they feel well and exhibit no symptoms of the disease, but they can pass it on to their children. Both parents must be asymptomatic carriers in order to have a child affected by this type of disease. Each child has a 25% (1 in 4) chance of receiving 2 mutated copies of the gene (1 from each parent) and getting the disease itself. Each child has a 50% (1 in 2) chance of receiving a mutated copy of the gene from one parent and a normal copy from the other. These children will be asymptomatic carriers like their parents, and can pass the mutation on to their children in turn. Each child has a 25% (1 in 4) chance of receiving 2 normal copies of the gene (1 from each parent) and being healthy, with no chance of passing on the disease to the next generation. 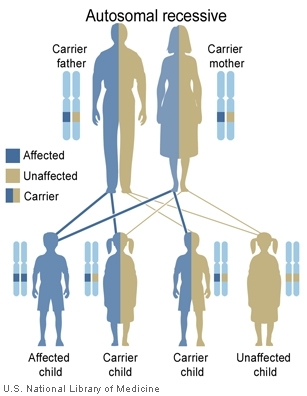 Brothers and sisters of patients with an autosomal recessive condition also have a 50% chance of being asymptomatic carriers, a 25% chance of getting the disease and a 25% chance of being healthy non-carriers. In the hereditary fever syndromes, carriers of gene mutations are usually completely well. It is very rare for them to develop the disease and if they do it tends to be milder. Men and women have equal chances of receiving the mutated genes, and of developing disease or being carriers. 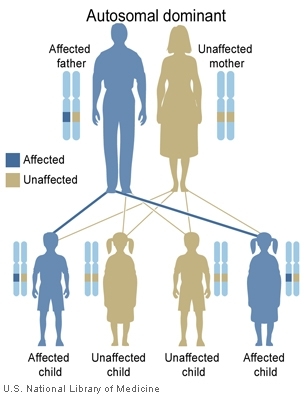 Autosomal dominant inheritance is illustrated in the figure above.The blue box represents an affected gene, carrying a mutation and the yellow-brown box represents an unaffected (normal) gene. The two columns next to each person in the figure represent two identical chromosomes (strings of genes) each person inherits, one from each parent. When a condition is autosomal dominant, the presence of just one copy of a mutated gene can cause the disease. In the figure, the father has one copy of a mutated gene, and one copy of a normal gene. He therefore suffers from the disease. The mother, like the vast majority of the population, has two normal genes and is healthy. Each child gets one copy of each gene from their mother, and one from their father. Each child has a 50% (1 in 2) chance of receiving a mutated copy of the gene from the father. Each child has a 50% (1 in 2) chance of receiving a normal copy of the gene from the father. Half of the children have a mutated gene and develop the disease. They can then pass the mutated gene and the disease on to half of their children. Half of the children have two copies of normal gene. They are healthy and they cannot pass the disease on to their children. Brothers and sisters of people with the disease have a 50% (1 in 2) chance of having the mutated gene and developing disease. Men and women have equal chances of receiving the mutated gene and of developing disease. A few people who have inherited a mutated gene never actually develop disease. The reason for this is not known. A parent may have suffered from mild disease and may not have sought medical attention. The mutation may have arisen in the patient themselves for the first time.